Rally the Readers: Harry Potter Moment of the Week (4): What Would Your Animagus/Patronus Be? Harry Potter Moment of the Week (4): What Would Your Animagus/Patronus Be? What Would Your Animagus/Patronus Be? Don't you ever wonder what your animagus and/or patronus would be if you were a witch/wizard? Well, I know what ours would be! Ally would be a monkey because monkeys are weird, friendly, and sometimes a little terrifying. Lee would be an owl 'cause she's so smart and stuffs. Also, Lee practically stays up until dawn reading. I would be an octopus because I love octopuses, and they love me, too. What do you think your animagus or patronus would be? I want to fly really, really badly so I would be some sort of bird. Maybe a peregrine falcon because they're super fast and I would love that. Ok my patronus, since you seem to have some kind of control as to what your patronus would be I'd think mine would be a wolf. One because I love dogs, they make me happy, wolves are fierce and loyal and huge and I would feel very protected, three I love Remus Lupin and thinking of him makes me happy xD. As for an animagus they seem to represent who you are - Sirius was a dog which fits because he's loyal, Peter was a rat and people who are snitches tend to be called rats, James was a Deer-stag which apparently in Scottish Gaelic poetry is seen as a noble creature and is used in comparison to a famous warrior, hero or chief. McGonagall was a cat which are intelligent, solitary and independent creatures. Rita Skeeter was a beetle which seem to have many meanings including creativity and resourcefulness. For my animagus I just typed in some of my my qualities into google and typed animal symbolism. I surprisingly but happily got the badger :). Happy because I am a Hufflepuff ^_^. Ahhhhh such a good idea! I think Id end up being something like a penguin haha. Waddling about and swimming and slipping everywhere. That is definitely a great question. My two favourite animals are Lions and monkeys, but since Monkeys can jump and climb and are genuinely highly intelligent, I would probably want my patronus/animagus to be a monkey! I would love to be able to transform myself into an owl so that would be my Animagus. As for my patronus, I've heard dolphins are great at protecting people! Also, they're friendly and super cheery -- kind of like me! I love what you guys chose to discuss! I have always wondered what my animagus/patronus would be. 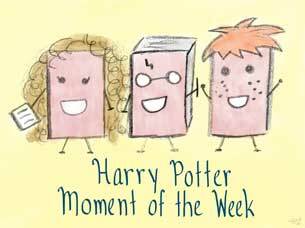 I was hoping to post this week's and last week's together today, but I think I'm going to have to wait until Saturday to get caught up on my Harry Potter Moment posts. I think your choices are excellent! I LOVE monkeys, and almost everyone I know enjoys owls. I think my patronus would have to be a penguin cause I love them so much. Jaclyn @ JC's Book Haven. A monkey!! WHA!!! I would want mine to be a cat but it would probably end up being something random like a fish. Mine would be a crow..it keeps coming up in my art over and over again..and I like that is symbolizes regeneration!